On my son’s third birthday I broke his heart. I did not do it purposely. But I did it nonetheless. It started innocently and with lots of good intentions and well, actually, a lot of excitement on my part. You see, my son absolutely, 100% adores Lightning McQueen. From the movie Cars. You know him? He’s the lead character that Owen Wilson voices. So what better cake could a loving mother prepare for her son on his 3rd birthday than a replica of Lightning MQueen himself? None. Damn right! Now I am a fully trained and qualified chef and pastry chef. Bah!!!! I said, I will be able to whip that up in no time. So planned to start after the kids had gone to bed. Which is just what I did. I started at 8pm. I thought I would be finished about 1am. At 1am I realised I probably wasn’t going to finish until 5am. I finished at 4.32am. Man, talk about a labour of love. The last few hours are a haze of coffee induced blur. How I managed to stay awake the whole next day is a true feat of endurance. What with Babygirl, Birthdayboy and Eldestboy all vying for my attention as I slogged my way through. Anyway, it was all going to be worth it to see the look on Birthdayboy’s face. And it was. His little face lit up like the proverbial christmas tree. He was soooooooooooooooooooooo excited. He could not believe this cake was for him. Wow Mamma, you really pulled one out of the bag there I thought to myself. Beaming with happiness. We sang happy birthday, we blew out the candles and then, with gusto I plunged the knife into the car to start serving it up. The tears and wails were as if I had taken the knife and plunged it into little birthdayboy’s teddy bear. “Nooooooooooooo! Mamma broke my car!!!!!! MAMMA BROKE MY CAR!!!!!!!!!!!! Sob, wail, tears, tears and more tears. It took hours to calm him down. And he wouldn’t eat it. Not a single piece. I can absolutely recommend How To Cook That. The tutorials are brilliant. 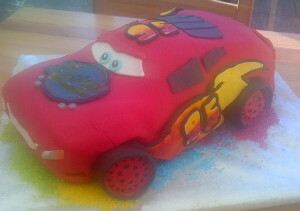 This entry was posted in Humour, Recipe and tagged Lightning McQueen Cake by Mamasim. Bookmark the permalink. Hi Ann! Thank you. It’s too funny. The rest of the family enjoyed eating it even if birthday boy didn’t! Love your site. I’m going to do your flower cake for babygirls birthday in a few weeks. Will let you know how I get on. And every time, when he’s older, he’ll drag that story up as an instance of how horrible his mother was to him. To tease you 🙂 Absolutely fabulous looking cake by the way.